In early December, I did a course on visual diaries. I thought the course would be about keeping a visual diary and was very surprised when I received the materials list to find that we were going to make a book. I nearly pulled out of the course but then decided to give it a go. Barbara Jackson, a local art teacher, was a good teacher and I was pleasantly surprised to find that bookbinding could be fun and easy. We started by making a simple pamphlet book. And then moved onto a more complex concertina book. We did spend a bit of time working on what to put into journals - and Barbara showed us lots of examples of her wonderful journals - but I didn't make much progress with mine. 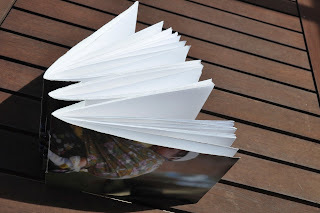 I hope to do Sharon Boggon's Studio Journals course next year to learn more about visual diaries - but I don't think I'll make my own book for the course. You don't have to make your own book for Sharon's course it is all about keeping journals and what to look for. Thanks for dropping by and leaving a New Year comment and I hope all goes well for you in 2010. I agree with Doreen, Sharon's course is well worth doing. 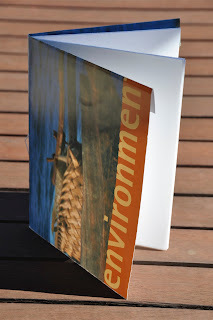 The books you made will come in handy for something along the way and can also be adapted for textile covers.